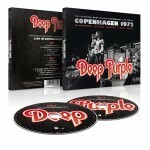 “Copenhagen 1972” is the second release of the earMUSIC “The official Deep Purple (overseas) live series”. While “Paris 1975” features Deep Purple MKIII in their final days, “Copenhangen 1972” captures the legendard Deep Purple MKII at the peak of their career. Same as the Paris show, Copenhangen isn’t a new release. The recording is basically the soundtrack to the “Live in Concert 1972/73” video (better known as “Scandinavian Nights (Live in Denmark 1972)” in Europe) and reintroduces three MKII bonus tracks of the video which were left out on the Sonic Zoom CD release. In addition to these tracks (recorded on May 29, 1973 in New York at Hofstra University, Hempstead, Long Island) a track called “1971 Australian Interview” has been included as additional bonus. The main show, recorded at the KB Hallen in Copenhagen, Denmark dates to March 01, 1972 and shows Deep Purple right before the release of the “Machine Head” studio album, Ian Gillan introducing the opening number “Highway Star” as “What we got is a new song. It’s one of the next album we got coming up. …”. While a couple of Machine Head songs made the first of their now everlasting appearances, the show also included a rare live version of “Fireball” which had been replaced in the setlist by “Smoke On The Water” about a week later. Originally recorded as a TV feature, the recording – although remastered – still shows some weaknesses soundwise, especially when compared to more prominent recordings like “Made In Japan”: during the first tracks, guitar and organ are low in the mix while while drums and vocals dominate the scene, but this gets better during the following numbers. Contrary to the sound the band performance shows no compromises. The bonus tracks, sound better than the Copenhagen show but sadly offer just a small part of Deep Purple 1973. The interview is ok for a one time listen, offering standard topics like the audiences being “really fantastic”. The discs are packaged into a slim digipak with one disc sitting right above the other which means disc juggling and some unavoidable scratches are going to happen every now and then. Posted by andreas on Monday, July 8th, 2013, filed under Blog. You can follow comment on this post through the RSS 2.0 feed. You can leave a comment below, or trackback from your own site. does somebody know what the next release will be? and maybe a release date? I know they’re going to release a 1985 show from Australia which George Harrison played on this year. It’s never been officially released. Patrick @ 2 – great, I was at that gig in December 1984 in Sydney. Unless there was another concert in ’85, that Harrsion was a guest on as well? Where did you hear that info? Cheers. @ 4 Mc Gregor how was Gillan’s voice in that concert ? do you know whether was filmed ? I don’t think there has been any confirmation that the ’84 show is the George Harrison show. There were 3 concerts filmed in Sydney. He was only at one of them. The best concert from the 90s with the MIB is “Live in Stuttgart” from 1993.
al @ 5 – Gillan’s vocal was strong, he was in fine voice. We were lucky here in Oz & NZ, as Purple commenced their reunion world tour here, so everyone was fresh & very keen & dare I say it, getting along fine! Russ @ 6 – I don’t recall if there were cameras there or not, it is a long time ago! I went to the first 2 gigs, one of those with Harrison jamming on Lucille with them. I wanted to go to the 3rd gig, but the other Purple heads with me had had enough after 2, so I opted out of the 3rd as well! Good times indeed! Cheers. I think they don’t gonna release an Australian 1984 show. I was at the sydney gig in 1984 as well,Gillan sounded and looked great! Still the best gig have ever been to,all of 16yrs old!! They launched into Lucille,with george playing alongside Ritchie. I wish the Australian 1984 release is true…we have little live material from the reunion years with Richie. Knebworth 85, Nobody´s Perfect 87 live compilation and Birmingham and Stuttgart 93. While I am vague with my memory as to the possibility of any of the Sydney concerts being filmed, back in those days the filming of rock concerts wasn’t a big thing. I think we were just moving from Beta to VHS then & the compact disc wasn’t available either. Man it sounds like such a long time ago, & in some ways it is! I wouldn’t hold my breathe in anticipation for any ‘live’ filmed gigs from ‘way’ back then! But you never can tell, someone may have had the latest iPhone & filmed it! Hang on, they definitely didn’t exist back then. Which was a good thing, regarding not one person was holding one up in front of your face all night or worse, chatting & texting all the time! Cheers. They’re reissuing the third time SONIC ZOOM series, only this time not so named. With the hook to change the artwork and bonus tracks (already published as well) they are selling the same thing over and over again. And this is the fourth edition of Live in Copenhagen in 20 years! when let rest our pockets? Regarding an ’84 show…..don’t forget this posting on facebook back in December. They _did_ film Sydney and used it in snipptes for their epic postapocalyptic video to “Knocking at your Backdoor” *cough*. And if you look on youtube, there are many different video bootlegs from Sydney, most from constant but strange angles, so these seem to be leaked single-camera tapes. Big cameras can be seen at times, too. PS: This last recording has somehow been better restored sound wise than the previous releases of the show as far as I can hear, so I will shell out……. Live in Copenhagen 72 = Live in Denmark 72! The December 14 gig was the one that Harrison jammed with Purple, from my distant memory. I have watched a few youtube clips over the years including that jam on Lucille, but the quality of any filming remains the issue I suspect, as to what decent live footage may ever be available to be officially released. Cheers.